There are numerous practical and easy to use methods to improve business processes, some might say that there are too many! For many of us, choosing the right mix for our business can be an interesting challenge. Most of us just want to grab hold of an approach that works, apply it to our businesses, and then get on with our day jobs! This was the challenge that we considered when we developed the StreamLiner software; how can we take away as much effort as possible, so that you can have a straightforward, effective, process improvement experience? This article takes you through some of the functionality of the StreamLiner software to help explain how we met this challenge. Lets start with the waste walking element of StreamLiner. 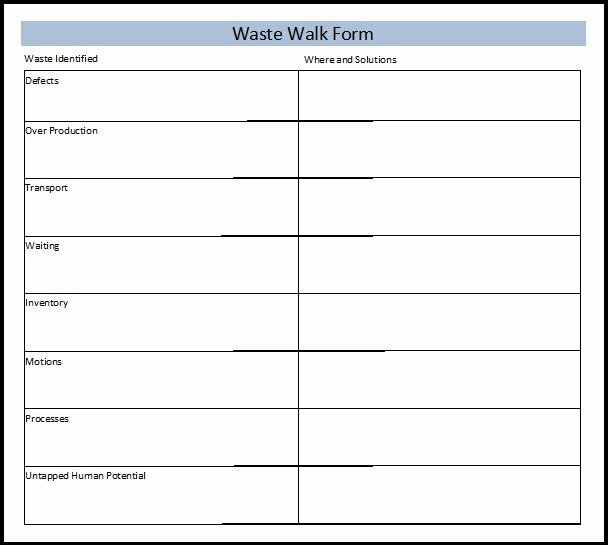 The waste walking method gets your teams involved with Lean / Continuous Improvement. It gives them a voice and helps you, to see things that would otherwise pass you by. If you haven't come across waste walking then I recommend that you read the waste walking article too. In StreamLiner we make it easy for you to print off ready to use templates to help with your waste walking exercise. As your team walks the process they can quickly capture the wasteful activity present within the business; whether it be defect producing activities and delays or overproduction and inventory issues. This waste walking template is just one way that StreamLiner can reduce the amount of effort it takes to get started with improving your business processes. Once you have completed your waste walk, and you have debriefed the walk with your team, you can quickly create improvement actions within the software. I'll come back to the topic of managing actions in a moment - which is a really powerful function of the software. So, let's say that, on top of your waste walking activities and the corresponding improvement actions, you identify a part of the process that needs further investigation. This brings us to Process Analysis. StreamLiner has a modified version of the Process Flow Analysis tool built into it. 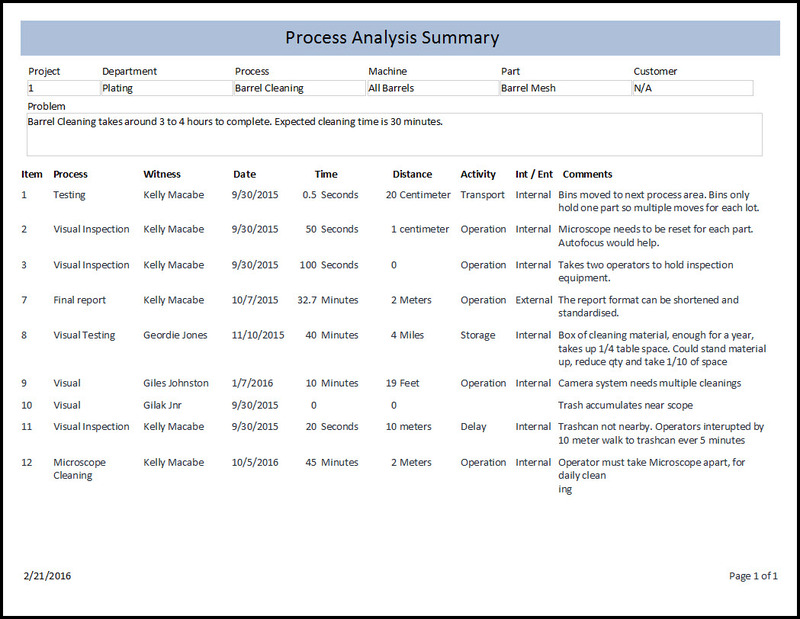 With templates ready for your team to do the analysis, the Process Analysis element allows you and your team to effectively drill down in a process and pull out all of the observations you need to complete a professional analysis of your activities. This can be recorded within StreamLiner and then used to create meaningful actions. If you have never undertaken a Process Analysis exercise before then rest assured that the user guide that comes with the software includes an explanation of how you can run the exercise with your team, and guidance on how to use the software to accurately capture the information for later use and use it as a springboard for completing an action plan for improvement. Another tool within StreamLiner, which can help you to use the findings of your Process Analysis to an even better degree, is the CCC approach. CCC stands for Concern, Cause and Countermeasure. This brilliantly simple method further engages your team with generating improvements. This tried and tested approach, when done right, can yield even more improvement opportunities. The CCC approach can also be used on its own to start an improvement conversation. It really helps focus the team's mind on improving a very specific part of your business. 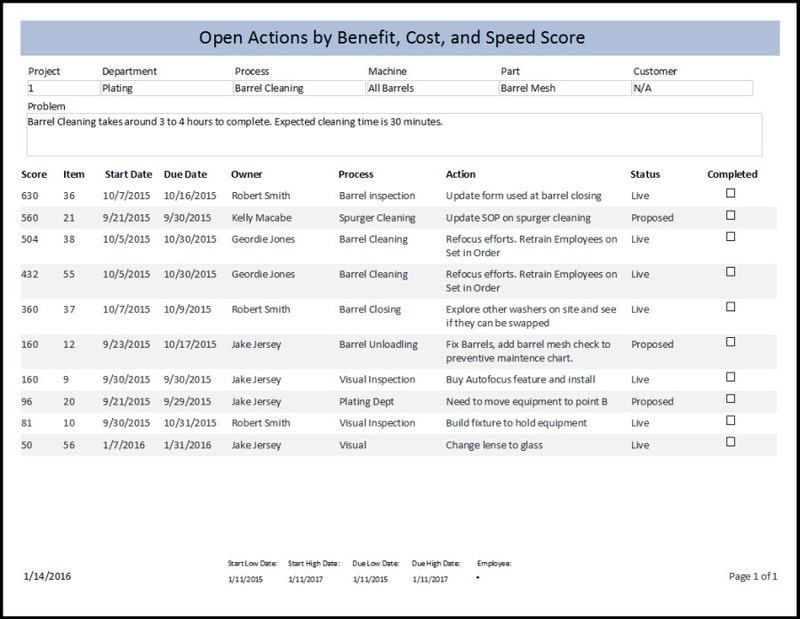 StreamLiner enables insights about the process gained from using the CCC tool to be converted into improvement actions. StreamLiner collects all these actions with the previous actions. Now your ready for the next stage of the improvement process - evaluation and prioritization. Now that you have a compendium of improvement actions that you can follow up on, the question becomes 'where do I start?'. This is another challenge that faces anyone who leads an improvement activity. We built this principle into the StreamLiner software. We wanted the software to inform the person using Streamliner about the most effective way for them to use their time and resources to improve the business process in question. The result of this thinking was the inclusion of our BCS scoring system. BCS is an acronym for Benefit, Cost and Speed. It is a simple approach that is similar to that used in FMEA (Failure Modes and Effects Analysis) or with Health and Safety risk assessments. You can learn more about this approach in the BCS article In summary you evaluate each improvement opportunity against the three factors of Benefit, Cost and Speed (each one scored out of 10 using our suggested scale) and StreamLiner multiplies the scores together to give a BCS score out of 1000. These scores can then be ranked in descending order to give you the 'biggest bang for your buck'. StreamLiner provides a reporting dashboard for your actions that allows you to generate reports based on different criteria. 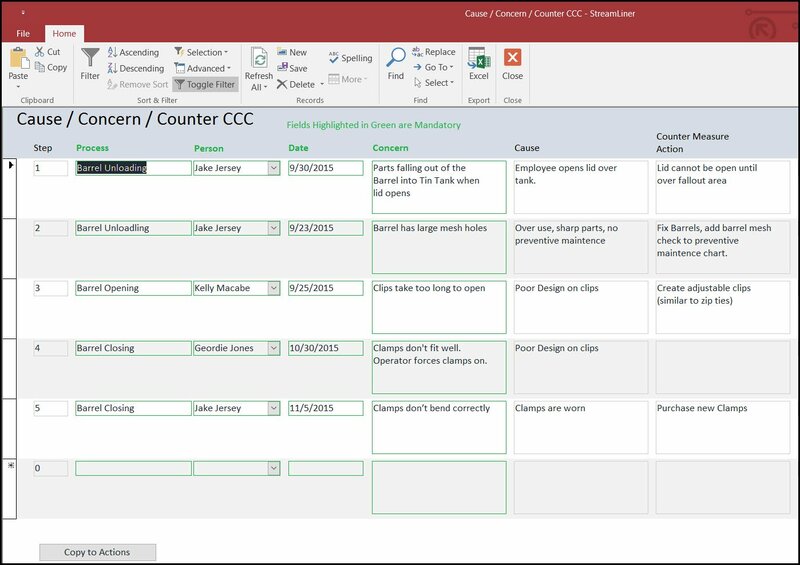 This dashboard aids the simple and effective management of all of the different improvement actions that you and your team generated through the course of the analysis exercises. From feedback we got during the testing and development phase of StreamLiner, we found this really did help reduce the time and confusion of managing multiple projects and improvement activities at once. Instead of having numerous plans scattered around your office, or trying to figure out relative priorities (for already stretched team members), StreamLiner allows you to have everything in one place. 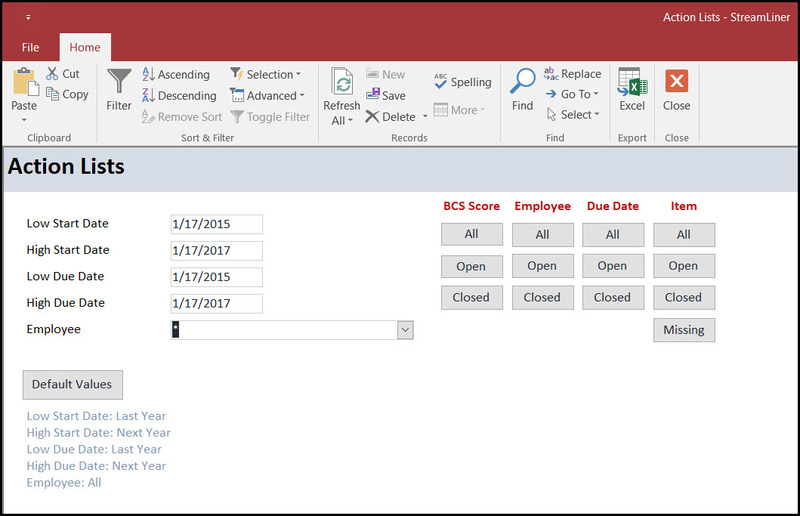 Whether you want to review your actions from a BCS score perspective, or from a completion date perspective, or by individual, StreamLiner can take the effort out of the administration of change actions. There are even more ways to use the actions element of StreamLiner; these are explained in the user manual which you will get when you purchase StreamLiner. One thing that StreamLiner doesn't do is help your team celebrate when you successfully improve your businesses processes. We're going to have to leave that one to you! If you have any questions about StreamLiner then please check out our FAQ page and introductory video. Have fun improving your processes.